What do you need to consider before going through with a hardwood floor installation? Learn here! You want to go with a hardwood floor for a room in your home (or maybe even all of them!) because of the way it looks, feels, and the timelessness it brings. However, you shouldn’t just jump into a flooring option without considering a few things first. There are a few questions you need to ask yourself before committing to a hardwood flooring project in your home. Where is the Hardwood Floor Going? The location of the hardwood floor installation may determine the sorts of options you have when you choose your material. Having hardwood installed on the second floor of a home is not the same as installing it on your ground level or basement. 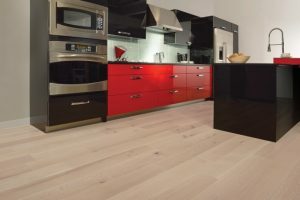 Familiarize yourself with the concept of “grade” – this concept will help you determine the types of hardwood at your disposal for a given project. The ground level of your home is on grade, any levels below the ground floor are below grade, and any levels above are above grade. For example, solid hardwood is not recommended for any projects on floors below grade because of the abundance of moisture that could compromise your flooring. What is the Condition of the Subflooring? The subflooring in your home will also help you choose the material for your new hardwood floor. There are three common types of subflooring – concrete, plywood, and particleboard. Concrete could potentially transfer moisture to a solid wood floor, so if you were looking to have solid hardwood installed you should think about having a plywood layer installed in-between. Particleboard will also need a layer of plywood added as it is not sturdy enough to accommodate a hardwood floor on its own. How Much Traffic Will the Floor Need to Take? High-traffic rooms such as kitchens will need to have a harder, more durable hardwood in order to stand up to the heavy wear and tear. You’ll also want to consider the particular maintenance needs of your floor to help you make the right decision. This entry was posted on Thursday, December 22nd, 2016 at 4:27 pm. Both comments and pings are currently closed.